The simple 1DOF systems analyzed in the preceding section are very helpful to develop a feel for the general characteristics of vibrating systems. They are too simple to approximate most real systems, however. Real systems have more than just one degree of freedom. Real systems are also very rarely linear. You may be feeling cheated are the simple idealizations that you get to see in intro courses really any use? It turns out that they are, but you can only really be convinced of this if you know how to analyze more realistic problems, and see that they often behave just like the simple idealizations. The motion of systems with many degrees of freedom, or nonlinear systems, cannot usually be described using simple formulas. Even when they can, the formulas are so long and complicated that you need a computer to evaluate them. For this reason, introductory courses typically avoid these topics. However, if you are willing to use a computer, analyzing the motion of these complex systems is actually quite straightforward in fact, often easier than using the nasty formulas we derived for 1DOF systems. 5.5.1 Equations of motion for undamped linear systems with many degrees of freedom. For a system with two masses (or more generally, two degrees of freedom), M and K are 2x2 matrices. For a system with n degrees of freedom, they are nxn matrices. This is again in the standard form. Throughout the rest of this section, we will focus on exploring the behavior of systems of springs and masses. This is not because spring/mass systems are of any particular interest, but because they are easy to visualize, and, more importantly the equations of motion for a spring-mass system are identical to those of any linear system. This could include a realistic mechanical system, an electrical system, or anything that catches your fancy. (Then again, your fancy may tend more towards nonlinear systems, but if so, you should keep that to yourself). 5.5.2 Natural frequencies and mode shapes for undamped linear systems with many degrees of freedom. First, let’s review the definition of natural frequencies and mode shapes. Recall that we can set a system vibrating by displacing it slightly from its static equilibrium position, and then releasing it. In general, the resulting motion will not be harmonic. However, there are certain special initial displacements that will cause harmonic vibrations. These special initial deflections are called mode shapes, and the corresponding frequencies of vibration are called natural frequencies. The natural frequencies of a vibrating system are its most important property. It is helpful to have a simple way to calculate them. The vectors u and scalars that satisfy a matrix equation of the form are called ‘generalized eigenvectors’ and ‘generalized eigenvalues’ of the equation. It is impossible to find exact formulas for and u for a large matrix (formulas exist for up to 5x5 matrices, but they are so messy they are useless), but MATLAB has built-in functions that will compute generalized eigenvectors and eigenvalues given numerical values for M and K.
The special vectors X are the ‘Mode shapes’ of the system. These are the special initial displacements that will cause the mass to vibrate harmonically. This returns a vector d, containing all the values of satisfying (for an nxn matrix, there are usually n different values). The natural frequencies follow as . For example, here is a MATLAB function that uses this function to automatically compute the natural frequencies of the spring-mass system shown in the figure. This gives the natural frequencies as , and the mode shapes as (i.e. both masses displace in the same direction) and (the two masses displace in opposite directions. If you read textbooks on vibrations, you will find that they may give different formulas for the natural frequencies and vibration modes. (If you read a lot of textbooks on vibrations there is probably something seriously wrong with your social life). This is partly because solving for and u is rather complicated (especially if you have to do the calculation by hand), and partly because this formula hides some subtle mathematical features of the equations of motion for vibrating systems. For example, the solutions to are generally complex ( and u have real and imaginary parts), so it is not obvious that our guess actually satisfies the equation of motion. It turns out, however, that the equations of motion for a vibrating system can always be arranged so that M and K are symmetric. In this case and u are real, and is always positive or zero. The old fashioned formulas for natural frequencies and vibration modes show this more clearly. But our approach gives the same answer, and can also be generalized rather easily to solve damped systems (see Section 5.5.5), whereas the traditional textbook methods cannot. 5.5.3 Free vibration of undamped linear systems with many degrees of freedom. As an example, consider a system with n identical masses with mass m, connected by springs with stiffness k, as shown in the picture. Suppose that at time t=0 the masses are displaced from their static equilibrium position by distances , and have initial speeds . We would like to calculate the motion of each mass as a function of time. Here, the dot represents an n dimensional dot product (to evaluate it in matlab, just use the dot() command). This expression tells us that the general vibration of the system consists of a sum of all the vibration modes, (which all vibrate at their own discrete frequencies). You can control how big the contribution is from each mode by starting the system with different initial conditions. The mode shapes have the curious property that the dot product of two different mode shapes is always zero ( , etc) so you can see that if the initial displacements u happen to be the same as a mode shape, the vibration will be harmonic. The figure on the right animates the motion of a system with 6 masses, which is set in motion by displacing the leftmost mass and releasing it. The graph shows the displacement of the leftmost mass as a function of time. You can download the MATLAB code for this computation here, and see how the formulas listed in this section are used to compute the motion. The program will predict the motion of a system with an arbitrary number of masses, and since you can easily edit the code to type in a different mass and stiffness matrix, it effectively solves any transient vibration problem. 5.5.4 Forced vibration of lightly damped linear systems with many degrees of freedom. It is quite simple to find a formula for the motion of an undamped system subjected to time varying forces. The predictions are a bit unsatisfactory, however, because their vibration of an undamped system always depends on the initial conditions. In a real system, damping makes the steady-state response independent of the initial conditions. However, we can get an approximate solution for lightly damped systems by finding the solution for an undamped system, and then neglecting the part of the solution that depends on initial conditions. This is a system of linear equations for X. They can easily be solved using MATLAB. As an example, here is a simple MATLAB function that will calculate the vibration amplitude for a linear system with many degrees of freedom, given the stiffness and mass matrices, and the vector of forces f.
% a forced linear system. % omega is the forcing frequency, in radians/sec. The function is only one line long! As an example, the graph below shows the predicted steady-state vibration amplitude for the spring-mass system, for the special case where the masses are all equal , and the springs all have the same stiffness . The first mass is subjected to a harmonic force , and no force acts on the second mass. Note that the graph shows the magnitude of the vibration amplitude the formula predicts that for some frequencies some masses have negative vibration amplitudes, but the negative sign has been ignored, as the negative sign just means that the mass vibrates out of phase with the force. If the forcing frequency is close to any one of the natural frequencies of the system, huge vibration amplitudes occur. This phenomenon is known as resonance. You can check the natural frequencies of the system using the little matlab code in section 5.5.2 they turn out to be and . At these frequencies the vibration amplitude is theoretically infinite. The figure predicts an intriguing new phenomenon at a magic frequency, the amplitude of vibration of mass 1 (that’s the mass that the force acts on) drops to zero. This is called ‘Anti-resonance,’ and it has an important engineering application. Suppose that we have designed a system with a serious vibration problem (like the London Millenium bridge). Usually, this occurs because some kind of unexpected force is exciting one of the vibration modes in the system. We can idealize this behavior as a mass-spring system subjected to a force, as shown in the figure. So how do we stop the system from vibrating? Our solution for a 2DOF system shows that a system with two masses will have an anti-resonance. So we simply turn our 1DOF system into a 2DOF system by adding another spring and a mass, and tune the stiffness and mass of the new elements so that the anti-resonance occurs at the appropriate frequency. Of course, adding a mass will create a new vibration mode, but we can make sure that the new natural frequency is not at a bad frequency. We can also add a dashpot in parallel with the spring, if we want this has the effect of making the anti-resonance phenomenon somewhat less effective (the vibration amplitude will be small, but finite, at the ‘magic’ frequency), but the new vibration modes will also have lower amplitudes at resonance. The added spring mass system is called a ‘tuned vibration absorber.’ This approach was used to solve the Millenium Bridge vibration problem. In most design calculations, we don’t worry about accounting for the effects of damping very accurately. This is partly because it’s very difficult to find formulas that model damping realistically, and even more difficult to find values for the damping parameters. Also, the mathematics required to solve damped problems is a bit messy. Old textbooks don’t cover it, because for practical purposes it is only possible to do the calculations using a computer. It is not hard to account for the effects of damping, however, and it is helpful to have a sense of what its effect will be in a real system. We’ll go through this rather briefly in this section. where y is a vector containing the unknown velocities and positions of the mass. where each is one of the solutions to the generalized eigenvalue equation. All the matrices and vectors in these formulas are complex valued but all the imaginary parts magically disappear in the final answer. HEALTH WARNING: The formulas listed here only work if all the generalized eigenvalues satisfying are different. For some very special choices of damping, some eigenvalues may be repeated. In this case the formula won’t work. A quick and dirty fix for this is just to change the damping very slightly, and the problem disappears. Your applied math courses will hopefully show you a better fix, but we won’t worry about that here. This all sounds a bit involved, but it actually only takes a few lines of MATLAB code to calculate the motion of any damped system. As an example, a MATLAB code that animates the motion of a damped spring-mass system shown in the figure (but with an arbitrary number of masses) can be downloaded here. You can use the code to explore the behavior of the system. In addition, you can modify the code to solve any linear free vibration problem by modifying the matrices M and D.
Here are some animations that illustrate the behavior of the system. The animations below show vibrations of the system with initial displacements corresponding to the three mode shapes of the undamped system (calculated using the procedure in Section 5.5.2). The results are shown for k=m=1 . In each case, the graph plots the motion of the three masses if a color doesn’t show up, it means one of the other masses has the exact same displacement. 1. 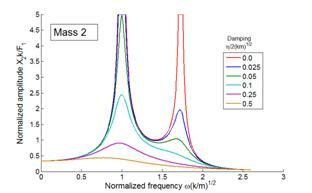 For each mode, the displacement history of any mass looks very similar to the behavior of a damped, 1DOF system. 2. 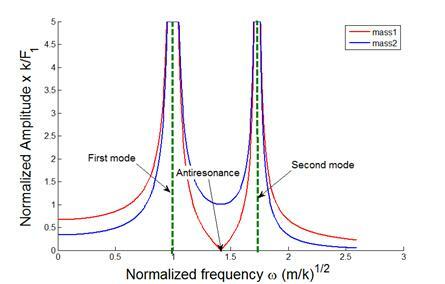 The amplitude of the high frequency modes die out much faster than the low frequency mode. This explains why it is so helpful to understand the behavior of a 1DOF system. If a more complicated system is set in motion, its response initially involves contributions from all its vibration modes. Soon, however, the high frequency modes die out, and the dominant behavior is just caused by the lowest frequency mode. The animation to the right demonstrates this very nicely here, the system was started by displacing only the first mass. The initial response is not harmonic, but after a short time the high frequency modes stop contributing, and the system behaves just like a 1DOF approximation. For design purposes, idealizing the system as a 1DOF damped spring-mass system is usually sufficient. Notice also that light damping has very little effect on the natural frequencies and mode shapes so the simple undamped approximation is a good way to calculate these. Of course, if the system is very heavily damped, then its behavior changes completely the system no longer vibrates, and instead just moves gradually towards its equilibrium position. You can simulate this behavior for yourself using the matlab code try running it with or higher. Systems of this kind are not of much practical interest. This is the steady-state vibration response. Just as for the 1DOF system, the general solution also has a transient part, which depends on initial conditions. We know that the transient solution will die away, so we ignore it. are the amplitude and phase of the harmonic vibration of the mass. If you know a lot about complex numbers you could try to derive these formulas for yourself. If not, just trust me your math classes should cover this kind of thing. MATLAB can handle all these computations effortlessly. As an example, here is a simple MATLAB script that will calculate the steady-state amplitude of vibration and phase of each degree of freedom of a forced n degree of freedom system, given the force vector f, and the matrices M and D that describe the system. Again, the script is very simple. Here is a graph showing the predicted vibration amplitude of each mass in the system shown. Note that only mass 1 is subjected to a force. 1. We observe two resonances, at frequencies very close to the undamped natural frequencies of the system. 3. In a damped system, the amplitude of the lowest frequency resonance is generally much greater than higher frequency modes. For this reason, it is often sufficient to consider only the lowest frequency mode in design calculations. This means we can idealize the system as just a single DOF system, and think of it as a simple spring-mass system as described in the early part of this chapter. The relative vibration amplitudes of the various resonances do depend to some extent on the nature of the force it is possible to choose a set of forces that will excite only a high frequency mode, in which case the amplitude of this special excited mode will exceed all the others. But for most forcing, the lowest frequency one is the one that matters. 4. 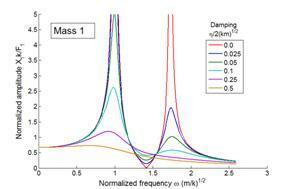 The ‘anti-resonance’ behavior shown by the forced mass disappears if the damping is too high.